I think I've tasted these, but not sure. Are they used in Chinese food? That bat is huge! Love the lychee article, but what really caught my eye was "Nanna Edmed in Twead Head." It's great start for a poem in a children's book. You might want to work on that! Hope the holidays are enjoyable and your new year is bountiful and prosperous. How interesting! 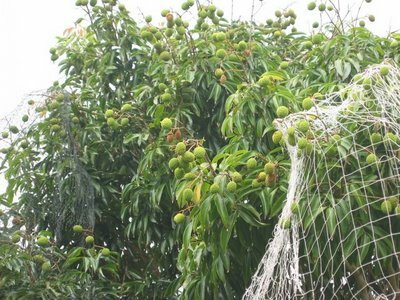 I have never even heard of a Lychee tree. I love lychees...there's also another plant that is very similar that I discovered up north: the rambutan..and I am totally unable to tell the difference between them. 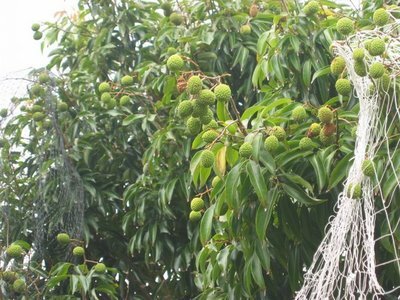 My Nan and Pop lived in Bowen and Xmas as a kid is filled with memories of Bowen mangoes and lychees arriving by freight..*yum*. blueblue: The Lychee and Rambutan do look quite similar, infact, they share the same plant family too. Sapindaceae. The Rambutan has many soft spinterns or bristle like appendages on the skin of fruit. Whereas the Lychee lacks these and has segmented protuberances instead. (similar in appearance to that of Raspberry or Blackberry fruit). Both of them are excellent eating in my opinion. And very common throughout SE Asia. blueblue: It just occurred to me that you may have been referring to taste rather than appearance of Rambutan/Lychee. 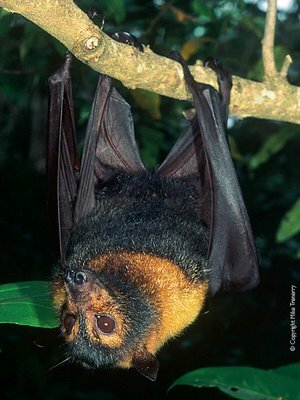 Hi, in my country (New Caledonia, south pacific) this kind of bats are very appreciate: even more than lychee ! they're protected by law to avoid a massive hunting. Theire meat is delicate and tasty, you can cook it roasted finishing with a splash of whisky. Preparation consist in burning the fur, but keep the wings, they're delicious.